Everyone, have always asked me what is rashmiandi and I have stalled, this question every time. But today on the occasion of International Women’s Day I would like to talk more about rashmiandi. My name is Rashmi Lingappa, a dentist by profession and a lot of other things by mere interest. So, when I started this website I did not know what to name it. 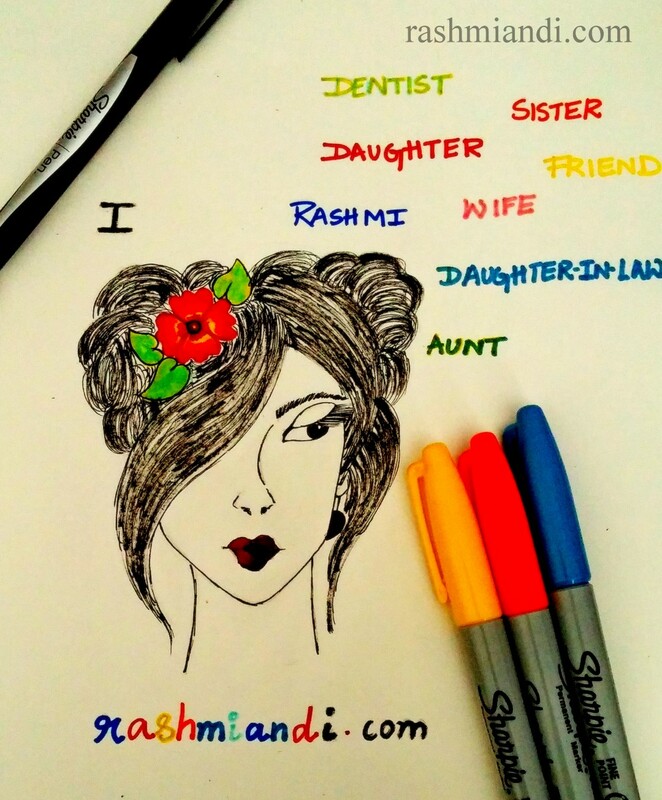 After a lot of thinking and asking myself a lot of questions I decided on rashmiandi. Here I have a beautiful sketch portraying the way I feel about rashmiandi. There are two sides to the sketch,i.e. Rashmi and I. You can see the word ‘I’, which is written in black color because that is the way the World perceives the ‘I’ in me. But when you see that portion with flower and colors you can see how I think of the ‘I’ in me. Its beautiful, crude and strong. Beautiful because she likes to be wild just like the wild flowers, crude because she doesn’t care about her hair or about her appearance. In the other half of the girl’s face you can see ‘Rashmi’, is defined by a lot of colorful relations. Well combed and tied hair, no colors but the defining relations are colorful. I am sure all of us have another side to our own self, the one that we try to ignore. Because it is easy to ignore and get colored in other defining relations than to define your own colors. So this website is my way of keeping that untamed, crude and strong ‘I’ within myself alive. Happy International Women’s Day, 2016. I like the way you have named you blog and very good analogy! It’s true that we are constantly filling in role of father, sister, son, grand daughter. each of which is unique…but somewhere we are also “ourselves” who has his own identity, choices, like and dislikes!